Biostrap's fitness tracker could not look more generic if it tried, yet what it aims to be is far different from the likes of Fitbit, Garmin and co. It's a wearable of two parts. There's the wrist device, which tracks heart rate variability, oxygen saturation and respiratory rate; and there's the shoe pod, which tracks exercises. Together, the goal is to monitor biometrics on a far deeper level than anyone else is doing right now. "I think there's still a need for accessing data you don't typically get with other wearables," says Biostrap CEO Sameer Sontakey. 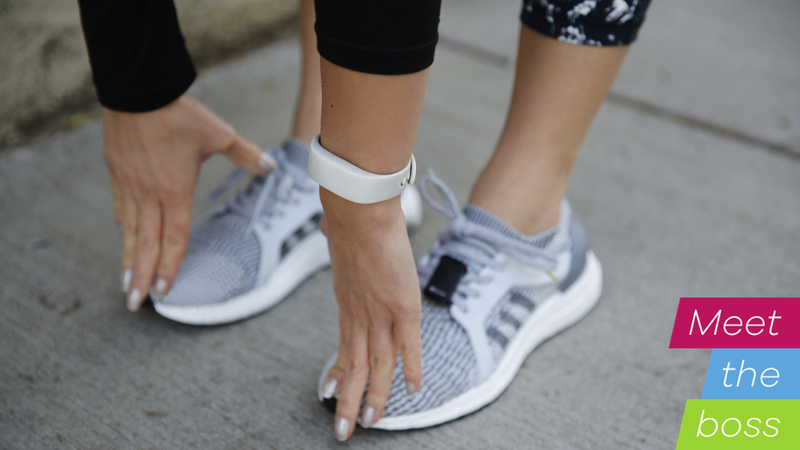 "Most wearables are pretty much a pedometer and heart rate tracker". Rather than the green PPG LEDs we're so used to seeing in fitness trackers and smartwatches, Biostrap's wristband uses red and infrared lights. "Everyone is using a green LED, with a 540 nanometer wavelength," says Sontakey. "The body absorbs green really well, it's great for reducing signal distortion, but it doesn't penetrate deep. A lot of it is absorbed by your body so you don't get anything deeper than heart rate." What can HRV tell us? Heart rate variability is the new metric in town, and measures the gap between your heartbeats. The longer the gap, the better rested you are; shorter gaps mean you could be stressed or overworked. HRV has been linked to diabetes, hypertension, obesity and problems with the immune system. By using different lights, Biostrap can capture what it calls "high-fidelity waveforms", giving it more useful feedback like HRV, oxygen saturation and respiratory rate. We've started seeing health titans like Fitbit and Garmin focus on heart rate variability, a measurement of the time interval between heartbeats. It's a better indicator of overall health - or as Sontakey puts it, "There's chronological age and there's biological age, and HRV is essentially the way to measure biological age." In fact, while Biostrap measures HRV and resting heart rate, it doesn't track active heart rate, so while you can use the shoepod to track a run or other exercise, your heart rate won't be taken into account. The downside of using these different sensors is a higher noise-to-signal ratio. Biostrap takes a 30 second reading every two minutes, but if there's any kind of movement or other distortion it throws the data out. The device does its best tracking at night, says Sontakey, while during the day it will only take readings when users are relatively still. "There's a lot more signal distortion but there's so much more depth waveforms you can gather. That's how we can get other attributes that other wearables won't be able to." As for the shoe pod, this is meant to be able to automatically detect and track different exercises, when used alongside the wristband. "You do about 10 to 12 reps of that and you've taught it how that exercise or movement looks," said Sontakey. "Right now we're just applying it to exercises, but you can imagine it applying to basketball shooting or a golf swing, or anything that requires consistency or accuracy." Sontakey says he considers Biostrap a software company. "I'd love to have someone else do hardware," he says. "All our algorithms are in our cloud. There's so much we can do with just the raw data we don't want to do it on the firmware like most people." The company has been running for about two years and is mostly self-funded. Its biometric and activity tracking is afforded through a licence to Wavelet Health's (formerly Amiigo) biometrics platform. Only in the past few weeks has Biostrap started shipping devices, and Sontakey seems hesitant to push this out as a mainstream wearable until they've had more feedback. He concedes that if this is going to have mainstream reach, the next device will need to have a green optical sensor for tracking active heart rate, even though it's not something Biostrap has set out to do. This is probably why Sontakey seems hesitant to make a big splash about the device right now. You won't have seen Biostrap advertised much (although it's started popping up around the net recently). Sameer is pretty active on forums and Reddit, where he sometimes refers to HRV as the "holy grail" of biometrics. One thing that's clear about Biostrap is how incomplete the idea is, and while it will present general trends (all in the app; there's no display on the tracker), it's up to the user to work out what that means. Sameer says one thing they're looking to is to "dumb down" this experience in a way that provides more surface-level insights. And it's a harder sell - Biostrap doesn't have the same surface value as say, a Fitbit Charge 2 or even a Garmin Vivosmart 3. The challenge is in convincing people to replace their existing wearable for something that may give a better insight into their health in the long term, but (at least for now) demands more work - and costs $249. "A wrist is real estate, you can't have two wearables on one hand," Sontakey says. "So you're fighting with other wearables to take that space. So still people might have one and say well I have a Fitbit, what do I need this one for?" Biostrap also needs to prove it's accurate, and Sameer says the company is looking to get FDA approved. It wants to get to 98% accuracy, which will require further tweaking algorithms, but Sontakey says they're already in the gold standard when it comes to heart rate. But proving accuracy will be key if it wants to topple any of the big players dominating this space, and prove that, when it comes to monitoring our health, it's time to look deeper.